Brown butter asparagus with caramelized shallots is an amazing spring side dish that you will want to cook all season long. Bright green asparagus spears are roasted until just tender and seasoned with brown butter and caramelized shallots. The mixture of flavor and textures allows for each bite to be more delicious than the last. You can serve this dish alongside a beautiful filet of salmon, roasted chicken breast or as part of a vegetarian meal. Step 1: Heat a saute pan or cast iron skillet over medium low heat. Melt 2 tablespoons of butter and add the shallots. Cook them for 7 to 10 minutes until just beginning to soften. Add the garlic and continue cooking, stirring occasionally and scraping the bottom of the pan. Every 5 to 10 minutes check on the onions to make sure they not burning. You'll want them to be a light brown or golden color. After 20 minutes, deglaze the pan with orange juice and allow to cook for another minute or two. Season lightly with salt and pepper. Once the liquid has evaporated, remove from heat and set aside. Step 2: Meanwhile, prepare the asparagus. Preheat the oven to 425 degrees Fahrenheit. Place the asparagus on a baking tray. Coat the spears with olive oil and season with salt and pepper. 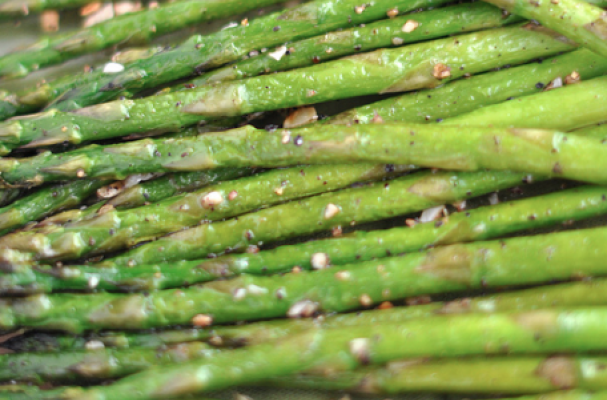 Arrange the asparagus in a single layer and bake for 7 to 10 minutes. Step 3: Place a small saucepan over medium heat and melt the remaining 4 tablespoons of butter. When it begins to froth, remove the layer with a small spoon. Cook the butter until it turns brown and smells nutty. Remove from heat immediately so it does not burn. Step 4: Plate the asparagus and spoon the brown butter over the top. Garnish with the caramelized shallots. Serve hot.